More than 1,050 people were killed in crashes involving a teen driver in 2016 during the 100 Deadliest Days, the period between Memorial Day and Labor Day. That is an average of 10 people per day – a 14 percent increase compared to the rest of the year, according to data analyzed by the AAA Foundation for Traffic Safety. As school lets out for summer, AAA stresses the importance of preparing and educating inexperienced teen drivers for some of the most dangerous driving days of the year. • 36 percent of all motor vehicle fatalities involving teen drivers occurred between 9:00 p.m. and 5:00 a.m. In California, teen driver fatalities (age 16-19) increased 26.4 percent from 72 in 2013 to 91 in 2014. Males make up nearly 77 percent of teen driver fatalities, according to California Office of Traffic Safety statistics. 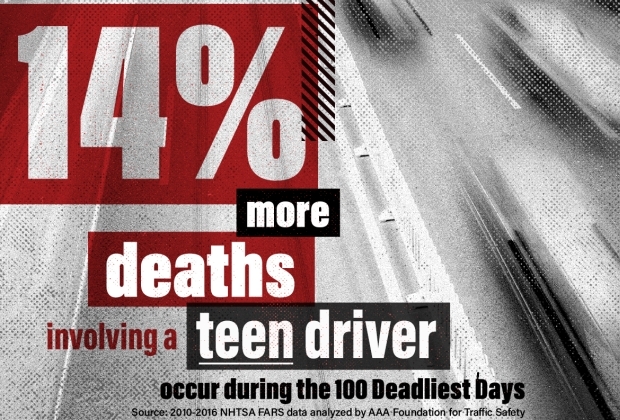 Local examples of the 100 deadliest days for teen drivers include last summer in Anaheim when a teen-age driver was arrested in a drunken driving crash after speeding down a residential street in the early morning hours. The male driver, 18, lost control of his vehicle about 3 a.m., police said, collided with another vehicle pulling into an apartment complex driveway. The other driver was pronounced dead at the crash scene. Last July, a teen driver in Santa Ana was arrested for driving under the influence when he drove onto a sidewalk and hit two pedestrians. In all, two teen-age pedestrians and also two passengers were hurt. In Poway, a female teen driver was killed when the Ford Focus she was driving crashed into a truck that had broken down at the side of the road. Her teen passenger was taken by air ambulance to a local hospital for treatment. • Discuss with teens early and often the dangers of risky driving situations, such as speeding and nighttime driving. • Teach by example and minimize your own risky behavior when behind the wheel. • Make a parent-teen driving agreement that sets family rules for teen drivers. Consider setting driving limits that are stronger than a state’s law, and enforce those limits. TeenDriving.AAA.com has a variety of tools, including licensing and state law information, to help prepare parents and teens for not only the dangerous summer driving season, but also all year long. The site also features new interactive widgets highlighting teen driving risks, as well as a social host quiz. The Auto Club also offers Dare to Prepare workshops for parents and teens. It offers resources for parents on how to be effective in-car coaches as well as advice on how to manage their teen’s overall driving privileges. Go to www.AAA.com to register for an upcoming summer workshop.